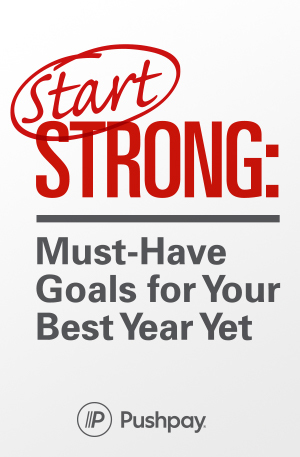 Start Strong: Must-Have Goals for Your Best Year Yet! The first 100 days of the new year can be the strongest indicator of a successful year overall. Sports and movies thrive on big comebacks where teams or individuals brilliantly overcome their lackluster performance in the very last inning. But the popularity of these stories hits home the inarguable fact that comebacks are very, very, very rare. It’s safe to say a bad start usually results in a bad finish. Start the year off right by downloading this ebook today. Build a strong foundation for 2019, and get ready for the best year you’ve ever had. Pushpay has been an incredible partner. Not only has Pushpay made it easy for our people to be generous, the Pushpay team has continued to invest in improving the giving experience while providing exceptional support along the way.